The editor, Mervyn Walker, gave me a copy of this novel in exchange for my review. There is a keen sense of life not being fair in the The Griffin’s Boy (The Griffin Riders’ Chronicles). There is desperation of circumstance that may be familiar to some readers. The Griffin Riders are children born into their elite circle. They don’t earn a place by skill or work, but by the noble bearing of the family into which they’re born. Neb’s ambition seems hopeless if not a bit silly at the start of the work and therein lays the brilliance. Neb aspires in a way that will translate to young readers and succeed or fail, the message of nothing being easy for most of us. His name literally means “no one” and at the start of the novel, Neb is no one. The setting is rather Harry Potteresque in that it is a world next to a world. Neb’s England is foggy and inhabited by magic and griffins. If you’ve read The Griffin Cryer (Griffin Riders), the first novel in the series, The Griffin’s Boy (The Griffin Riders’ Chronicles) is consistent while not dependent upon the prior work. Children who like fantasy will soak up the familiar landscape with foreign elements inherent in its atmosphere. There’s a wisdom in writing what you know and coloring it in with what you imagine. Children like the adventure and fun and the spunky characters that are slightly naughty and the characters of The Griffin’s Boy (The Griffin Riders’ Chronicles) fit that bill perfectly. They are engaging and real while maintaining that edge that will make the middle grade child want to keep reading and follow the adventures of Balkind and Neb. Will Neb become a Griffin Rider? The baddies are everywhere and somewhat nebulous. Neb and Balkind direct the story and carry the reader through. The last line is great and provides the reader great promise for what’s to come. 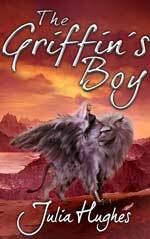 The Griffin’s Boy (The Griffin Riders’ Chronicles) is a great story. Pick it up today and follow this talented author. The Griffin’s Boy (The Griffin Riders’ Chronicles)is free on Amazon Kindle until March 5, 2014. Click here to read my review of The Griffin Cryer (Griffin Riders). For more information about Julia Hughes and her work, visit her website. You can connect with her on Goodreads, Facebook, Pinterest and Twitter @tinksaid.